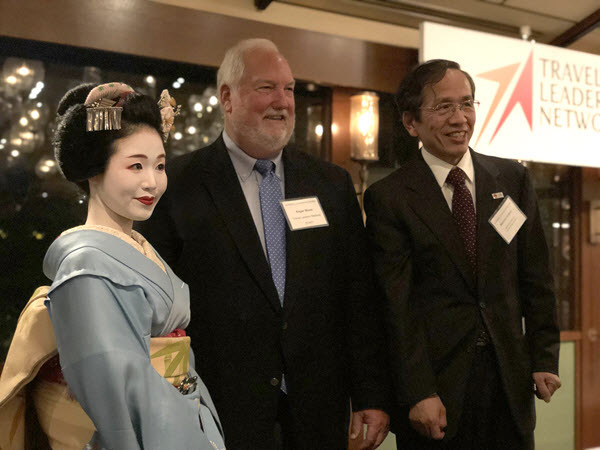 New York, NY (May 15, 2018) – More than 70 members from Travel Leaders Network – one of America’s largest retail travel agency organizations – recently returned from the 19th annual International Summit in Kyoto, Japan. In partnership with the Japan National Tourism Organization, Travel Leaders Network owners and managers, along with their guests, had the opportunity to experience one of the world’s most fascinating and historic cultural destinations from April 27-30, 2018. This year’s International Summit attracted 74 attendees, including Travel Leaders Network President Roger E. Block, CTC. The summit started on April 27, with a reception and dinner at Sodoh Higashiyama. This beautiful venue is the 1920s residence of master Japanese painter Seiho Takeuchi. Attendees also had multiple options for guided exploration of Kyoto’s unique sights, sounds and tastes with highlights including a visit to Gion, which is Kyoto’s most famous geisha district, exploring the Nishiki Market and Nishijin Textile Center, eating seasonal foods and Kyoto specialties, and more. This year’s International Summit in Kyoto offered numerous opportunities for Travel Leaders Network owners and managers to enjoy networking with their peers, headquarters executives and select supplier partners. Those who attended say that their time spent in Kyoto not only created memories but will also help them better service their clients’ needs. In addition to the Japan National Tourism Organization, other sponsors for the International Summit included: AIG, Context, Delta, Globus family of brands, GOGO Vacations, Norwegian Cruise Line, Travelport, and Westin Hotels & Resorts.